4 - 5..........Dixi von Krakau. Körklasse 1 A (2 years of age). Bastian von Goldschmieding passed the Körung 'for life' with highest possible ratings for hardness and working drives (very high protection, fighting spirit, courage and hardness with middle sharpness). His sire, Bingo von Ellendonk, was the winner of the D.V. Meisterschaft in 1977 and passed the Körung 'for life' with highest ratings for hardness, courage and working drives. Bastian's dam, Assi von Langenhorst, was the FH-Landesmeister of Landesgruppe Westfalen and litter-sister to one of the most influential German males in Ali von Langenhorst. Dino: SchH 3 and DV-DM participant. Diva: SchH 3 and passed the Körung 'for life' with highest possible ratings for hardness and working drives. She was brood female for the Worringer Bruch Kennel in Nordrhein, Germany and dam of the vom Worringer Bruch “H, J, K, L, M” litters (Hanko, Hera, Joy). Dunja: SchH 3, DV-DM participant and passed the Körung 'for life' with highest possible ratings for hardness and working drives (very high protection, courage, fighting and hardness with middle sharpness). She was the foundation female for the Warringhof Kennel in Germany and is dam of the “A, B, C, E, G” litters (Alfa, Aischa, Cöbes, Cher, Cocoa). Gringo: SchH 3, FH, DV-DM participant and passed the ZTP with 1A rating for character and SG for conformation. He earned the highest protection score (98 points) in the 1994 D.V. Meisterschaft. Elisha: IPO 3 and dam of the vom Teufelshof “I, K, L, O” litters (Kyra, Lump). Fasco: SchH 3, DV-DM participant. Francis: SchH 3, FH and passed the Körung 'for life' with Körklasse 2A rating. 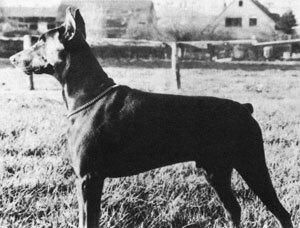 She was the foundation female for the vom Westerberg kennel in Germany and dam of the “B, C” litters (Bella). Castor: SchH 3, FH and passed the Körung 'for life' with highest possible ratings for hardness and working drives.